We get a lot of questions from folks about UNESCO and World Heritage Sites, as they tend to feature prominently on AwayGoWe.com. Lori and I are both avid fans of, not only the places that tend to receive the UNESCO designation and status, but also the UNESCO institution, itself. The following information was adapted from whc.unesco.org. In response to the peril in which many of the world’s great cultural and natural heritage sights found themselves in the mid-20th century, largely due to rapid industrialization and population growth, the Johnson administration called for a World Heritage Trust conference to examine how to preserve and conserve such areas for future generations. Such efforts largely contributed to the formation of the World Heritage Program which was founded by UNESCO’s adoption of the Convention concerning the Protection of the World Cultural and Natural Heritage on November 16, 1972. 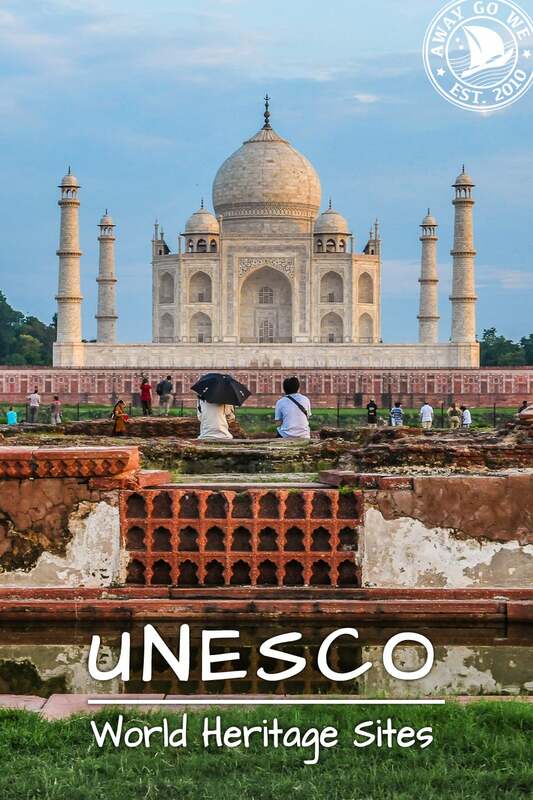 As of 2017, the convention has been ratified by 193 nations, with 1,007 UNESCO World Heritage-inscribed sites across the globe (check out the full list here). Of the sites, 832 are cultural, 206 are natural and 35 are mixed. By country, Italy boasts the most World Heritage Sites (53), followed by China (52), Spain (46), France (43), Germany (41), India (35) and Mexico (34). Undoubtedly, you’ve heard of many UNESCO Sites, such as India’s Taj Mahal, Greece’s Acropolis, Ecuador’s Galapagos Islands, Australia’s Great Barrier Reef, Peru’s Machu Picchu, Egypt’s Pyramids of Giza, Tanzania’s Serengeti National Park, Italy’s Venice, and the U.S.’s Yellowstone National Park, to name a few. To be considered for UNESCO status, the site must meet at least one of ten criteria. UNESCO-designated sites are receive special protections under international law such as the Geneva Convention in times of war. Additionally, such sites receive funding for conservation from the World Heritage Fund.